Electronic room temperature controller with integrated timer for temperature-based single-room control. Heating units can be controlled directly using the switched output, for example. Automatic changeover of "Heating" or "Cooling" operating modes using a separate input. Room temperature control using an internal and/or external temperature sensor as a room temperature controller, as a floor temperature controller or as a floor temperature limiter. Time program with up to 32 switching points (default settings pre-programmed at the factory). Separate program for cooling function. Party function for extending the comfort temperature by one, two, or three hours, or until the next switching point. Energy-saving function for manual activation of the night-time reduction until the next switching point. The hour display can be toggled between 12-hour and 24-hour mode. Vacation reduction via date input. 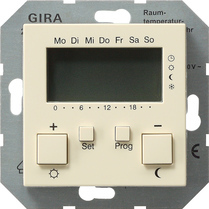 Within one hour of continuous heating, the room temperature controller automatically interrupts the heating process for 5 minutes (the heater is switched off). Remote sensor for measuring or controlling the floor temperature is optionally available.